By watering and fertilizing summer squash plants, you can help them reach their full potential and maximize fruit production. After all, you've spent the time and money planting the seeds. Now is the time to make sure your hard work pays off in a big way. 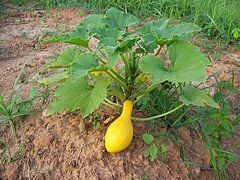 Summer squash plants are heavy feeders and will benefit from occasional fertilization. You can begin by working some compost into the soil when creating your mounds. Shortly after the seedlings emerge, a gentle dose of fertilizer will help your plants get off to a good start. You can fertilize them again after the blossoms have appeared and plants begin to set fruit. You can use a water-soluble or granule type fertilizer - the choice is up to you. 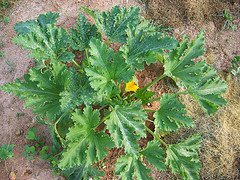 If fertilizing summer squash by using a water-soluble product, mix it with water according to the manufacturer's instructions. When using fertilizer that is dissolved in water, follow the guidelines below for watering your summer squash plants. If you choose to use a granule type fertilizer, choose a balanced one like 10-10-10. The nitrogen will help with the plant growth and the potassium and phosphate will help with fruit production. Scatter the granules around the plant at a rate suggested by the manufacturer, usually 1 1/2 pounds per 100 square feet. Try not to let the granules touch the plants themselves as it may burn them. After fertilizing summer squash with granules, water them in well with a slow soak. If you are lucky enough to live in an area with nutrient rich soil, it's very possible that you won't need to fertilize summer squash plants. Remember, fertilizer will only help a healthy plant grow bigger and stronger. Fertilizer will not transform a diseased and pest ridden plant into a healthy one. If you are interested in growing organic summer squash, several organic fertilizers are available at most garden centers. You can also help your plants by working a good amount of organic compost into the soil before planting. Summer squash have a fairy high water content and the plants will benefit greatly from regular watering. It's usually best to water once a week if no rain falls in your area. 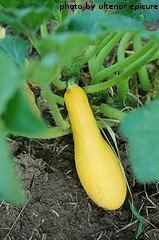 Summer squash plants usually need about 1 inch of water per week for maximum growth. To determine if your plants need water, dig down about 4 inches into the soil next to a summer squash plant, trying not to disturb the roots. if the soil at this depth is moist, you're in good shape and don't need to water. If the soil is dry, it's probably time to water. During the hot months of summer, it's common for summer squash plants to wilt in the afternoon hours. They will usually recover overnight. If your plants are wilted in the morning, it's probably time to water. Wilted plants in the morning could also be a sign of pest problems. When watering summer squash plants, focus a slow stream of water at the base of the plant. The water pressure should be slow enough not to erode any of the soil away. A slow, deep soak is the best method to avoid runoff. Avoid watering the tops of the plants as this can encourage diseases to develop. It's also a good idea to water in the morning hours. That way, the afternoon sun will evaporate any unused water, discouraging pests and diseases. A layer of mulch can also be applied around your plants to trap the moisture in the soil. Mulch is also a good way to keep some of the weeds out of your garden. When the mulch decomposes, it also helps by adding nutrients to the soil. Grass clippings, chopped up leaves, straw, etc... all work well for mulch. Now that you've learned about watering and fertilizing summer squash, it's time to think about harvesting them.